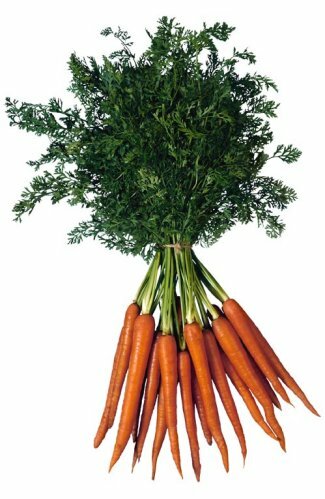 Growing Carrots is easy and great source of Vitamin A. Carrots are a hardy, cool season crop that can be planted in your organic garden as soon as the soil can be worked in the spring. Carrots require hefty amounts of moisture and are not tolerant of drought. Prolonged hot weather may not only retard growth, but result in an undesirable strong flavor and coarse roots. Pour your carrot seeds into a 5 gallon bucket along with Radish seeds (optional) for the area you're going to plant. Mix in sifted compost, soil or sand. Make sure you mix well. Broadcast over the area you're planting. Water well and never let the area dry out. This is intercropping and works every time for Growing Carrots. Within a week your Radishes will germinate first and by the time your carrots begin to germinate and grow you will be harvesting your Radishes making room for your Carrots. Diseases: Aster Yellows, Black Root Rot, Cotton Root Rot, Damping-Off, Growth Crack, Leaf Blight, Leaf Spot, Powdery Mildew, Root Knot Nematode, Southern Blight. 'Danvers 126' – has heavier yield than Danvers; smooth roots; tops withstand heat).